The mismatch extends to hard skills, too. Engineering, business and computer science majors are in highest demand, with at least two-thirds of employers seeking graduates in those fields, according to NACE. But fewer than half of the students surveyed by iCIMS majored in those subjects. College seniors feel good about their prospects: more than 90% of the students surveyed by iCIMS reported feeling confident about their interview skills. They also expect to earn over $53,000 in their first job, compared with average salary of $45,000 that recruiters expect to pay for those positions. Unlike many employers, Enterprise Holdings Inc. doesn’t expect college hires to arrive at work with all the exact skills they need. The car-rental company will hire roughly 10,000 college grads for its entry-level management training program this year. Those management trainees will be put on a two-year career-development program, where they will learn on the job, said Marie Artim, the car-rental firm’s head of talent acquisition. “This is a generation that’s grown up with syllabuses and structure,” which makes them a good fit for such programs, Ms. Artim said. Companies are planning to hire more graduates of 2017 than they did from last year. Employers feel that College graduates can do better in job interviews, such as asking questions about the company and researching the company before applying. this article basically talks about how adults have expectations for young people and how they mostly want to hire them because of the innovation and creativity they have and they want that in their business. College Seniors are unprepared and employers have low expectations. The generation is designed to be good with programs. This report discusses an employers ideas revolving hiring college grads. He feels as though they don’t have enough experience to be hired anywhere. Jobs should provide the students with training in order to succeed. The article concisely shares how future jobs are expecting much more our of college graduating senior classes. They however feel that many colleges seniors lack the skills and traits necessary for the work environment. Some people are hiring more of the class of 2017 simply because of adaptability and job readiness. Recruiters feel that the majority of college applicants are ineligible for the position because they lack the knowledge or skills needed to complete quality work. However, many Seniors feel prepared for the job, and believe their abilities excel what’s required. Lastly, there was a statistic showing that Engineering, Business, and Computer Sciences are in demand, yet, few Seniors major in those fields. Jobs are looking for the very best so when kids go to college the find before because the worlds technology keeps progressing so there are basically falling behind. So some kids need creativity and do what they want to do in life. Companies plan to hire more graduates of 2017 than they did from last year. Employers know that College graduates can do better in interviews, such as asking questions about the company and researching the company before applying. This Article talks about that jobs have a higher expectation for students who have graduated from high school. They have higher expectation because they want them too creativity. National Association of Colleges and Employers finds that employers expect to hire 5% more graduates than they brought on last year. Also 60% of employers in the survey said applicants ought to be more familiar with the company and industry. College seniors feel good about their prospects more than 90% of the students surveyed by iCIMS reported feeling confident about their interview skills. The article is saying that jobs have higher exceptions for the new grads. Some jobs are hiring more people from the class of 2017 because of adaptability and job readiness. The article is sayingthat jobs have higher exeptions for the new grads. Some jobs are hiring more people from the class of 2017. This article states that jobs will hire new grads. Some jobs will hire more people in 2017 bacause of their better Knowledge of having a job. 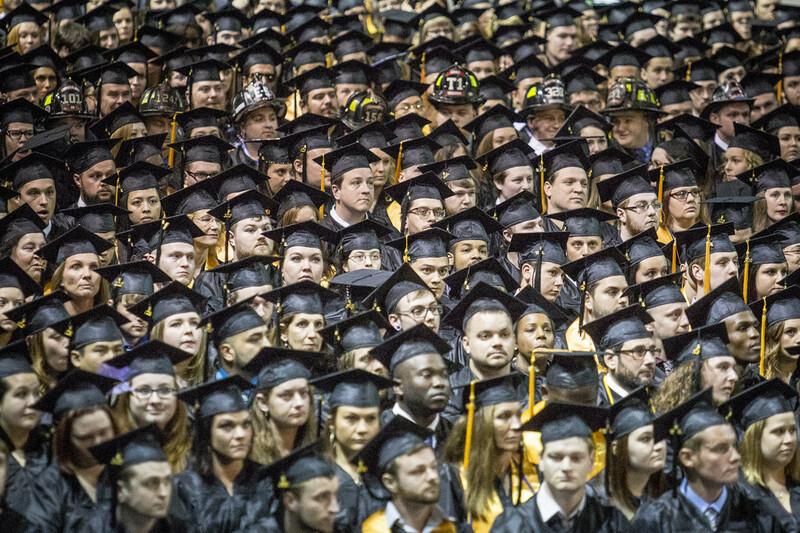 Companies expect to hire 5% more college graduates this year than last year. It also talks about how graduates are not prepared. College seniors are unprepared and employers have low expectations. Recruiters feel that the majority of college applicants are ineligible for the position because they lack the knowledge or skills needed to complete quality work. Yet many of the graduates think they’re ready. The article is saying that they feel that many college seniors lack the skills and traits necessary for the real world. Some people are hiring more of the class of 2017 because they are better prepared. Also, jobs are expecting much more out of college graduates. People need other people to work in the engineering and/or computer science field but not a lot of people are studying or even looking at the majors. They expect to earn $45,000 without the fields listed. this talks about how college seniors arent fully developed and ready for the real world. they still got a few things to learn. what this article talks about, is how companies are planning on hireing more college seniors this year than last year. These companies have high expectations. They want them to be prepared. Jobs are expecting the new kids to have learned something from college but kids barely get any new ideas. they get better ideas from gaining actual experience in a job than school……….. Employers think seniors don’t have enough skills to do certain jobs like business and accounting only 19.2% of seniors are being employed. This means they don’t think seniors are capable of doing it. 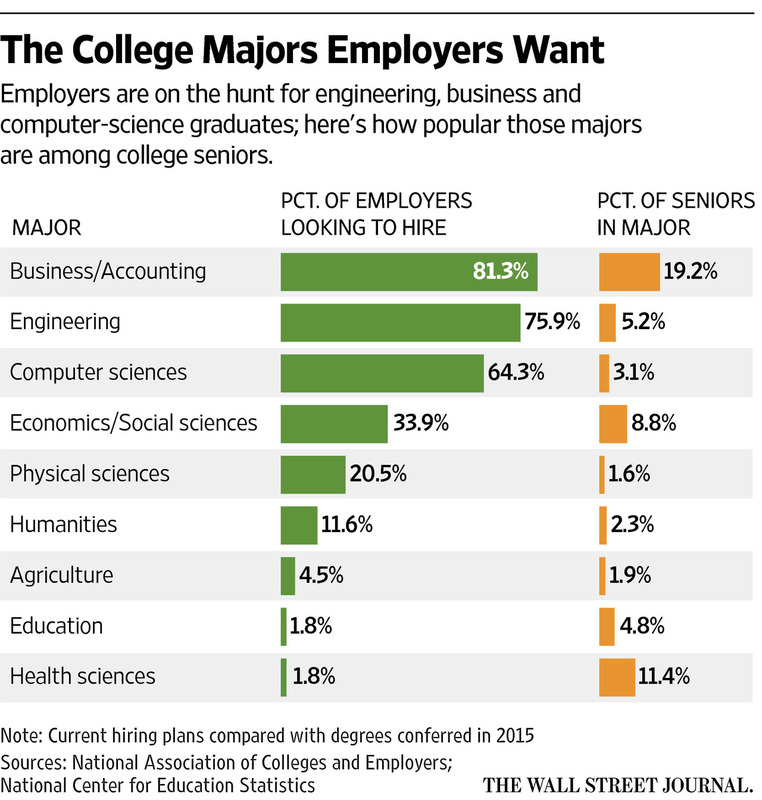 College seniors are mostly wanting to major in business/accounting and engineering. Employers that are looking to hire people and expect some unrealistic expectations. College seniors expect to earn over $53,000 on their first job. This article summarized is basically all about how college are having higher expectations we’re a new generation with new improvements and new technology so they have to expect us to know more than the past. Companies are planning to hire more graduates of 2017 than they did from last year. g. Employers that are looking to hire people and expect some unrealistic expectations. College seniors expect to earn over $53,000 on their first job. I think its nice that companies have the intention to hire more 2017 graduates. Employers however are often let down by the social skills and common courtesy, or lack thereof. Graduates should work on these flaws because the employment field is very competitive. This article is basiclly saying saying that some colleges are having higher expectations we’re a new generation with new improvements and new technology so they have to expect us to know more than the past. Many companies wants to be up-to date. They will search for the latest graduates because they have more latest, new and fresh knowledge than past students. College Seniors are unprepared and employers have low expectations for class of 2017. The generation is trained to work with programs. I think its crazy how the most knowledge needed subjects have less job opening in the future. It shows how one survives off of money rather than knowledge. Companies are expected to hire 5% more college graduates than last year, from the class of 2017; however, employers have found applicants to be unqualified for the fields that they are searching in, causing them to fail their interviews. Employers are looking to hire, and are struggling to find, people with majors in business, engineering, and computer science. Instead, students are studying other subjects such as health sciences. College seniors are being trained to work with programs and not to be creative and unique. Employeers aren’t expecting them to be as trained as colleges. Because there are new improvements and new technological improvements, most colleges have higher expectations for the class of 2017. They expect us to know more than the past. When it comes to courting recruiters, the Class of 2017 has some homework to do. IF you do good in school you going to have more opening jobs for you in the future. college seniors are being expected to know their field in a more creative and advanced way but what they learn in college is not because its not being updated tpo tadys technology and knowledge. Students should be experience on what they want to do in the future for many reasons. One of the reasons is so they know if it is their passion to accomplish it. Many job cites will most likely want to hire teens that high school graduates because they feel that now high school teaches them way more stuf than what they should know. They think that now teens are smarter and have the ability to create new things and share the ideas with the world.Many of the college students start getting better jobs than most adults beacause they have the ability to create. This article shows the percentage of students that will be hired and it increased by 5%. It also has a chart showing the college majors employers want and the people who have that certain major. The article states the percentage of students that will be hired. The chart shows the college majors and want certain jobs they will like to be in. The graduating college seniors of 2017 are more likely to enter the workforce because companies are planning on hiring 5% more of the graduates this year than they did last year. This is seemingly nothing but good news for the upcoming graduates and their parents and families. However, the graduates have more than a few things to think over because they are heavily unprepared and unqualified for potential careers and interviews. Not only this; but the engineering, business, and computer science majors are in the highest demand. Not only are seniors ill prepared for the daunting job market, they’re also ill prepared for life in general. The school that I go to teaches you how to find x in an equation, they teach the dates of WWI and WWII but they don’t teach life skills. How am I supposed to file my taxes and how do I even cook a meal? School teaches knowledge, but more and more they are taking time away from students. School doesn’t have to teach us how to cook, but they should not be draining us in academics, and swamping us in extracurriculars (which are more and more of a requirement) and taking time away from learning valuable skills on how to survive in the 21st century. I completely agree with the fact that high school students who have graduated have a strong chance to get accepted into a wide range of companies and businesses. This specific graduate degree gives their qualifications a major boost within choosing the right candidate. The article tells us readers that businesses and companies are planning to hire 5% more college graduates than last year, which is crazy! Additionally, these new employees are unprepared for working in these companies, as school is only teaching them knowledge, inapplicable to reality and real life. The modern education system has become a factory-like process. With the widespread and structured use of textbooks, learning has become rote and inapplicable to real-world situations. Students are never formally taught, but will all learn that following the rules and keeping your nose in the books will lead to success in school. However, this mentality is self-destructive when entering the workforce. When they enter into their first corporate jobs, many college seniors and graduates will realize that there is no syllabus to follow in the office and no teacher to guide them through every assignment. Instead of being able to fail and retake a test, a mistake may lead to their unemployment. These are the things that college seniors are unprepared for. I think that it is very important these days for people to be educated on topics important to today’s world and not jut pertaining to the subject they want to focus on and the career they want to go into. Today, many people are able to efficiently learn the lessons they need for the career they choose, but many do not know what do to after that and are not able to efficiently apply their knowledge they have from their education to their job since they are not taught life skills. I think people today should be educated on street smarts such as financing and how to do taxes or even, like mentioned in this article, how to find a job and write a capturing resume, and not just teaching them what they need when they get their desired job. Being unprepared is the ultimate shame. You pay thousands of dollars and never manage to survive. Survival of the fittest is the most important concept in social Darwinism. Society doesn’t understand me. According to all known laws of aviation, there is no way a bee should be able to fly. Its wings are too small to get its fat little body off the ground. The bee, of course, flies anyway because bees don’t care what humans think is impossible. Yes this is true. Employers have extremely high expectations of people who got straight out of college as if they already have experience in the field and it ain’t cool at all. I heard from a friend that, when going straight into their job into accounting, college didn’t prepare them all and was essentially a waste of money due to the fact that it didn’t help for their job. College, at this point, is putting in your time and money for the sake of getting a piece of paper that’s supposed to help you get jobs. We need to start implementing real life things into the education we learn everyday. As we do this we will be more easily introduced to the reality of the world. There is a certain expectation when entering the job market and college educated individuals are only prepared for already known expectations. Jobs do not follow the set pattern taught within schools and require a measure of coherency and improvisation that students entering the job market are not equipped to provide. This article highlight the future choices of industries and how they plan to hire regarding graduates of the Class of 2017. Although companies expect to hire 5% more college graduate than last year, these graduates are ill-equipped for many of the positions available in job fields. While schools like Whitney stress their purpose to prepare high school students for college, it seems that colleges need to better instruct students on how to secure employment in the job market. For all you graduating Seniors, action not manufactured resumes will get you that first corporate job. Volunteer/get a paid job at your targeted company’s sponsored charity. They all have one. Or try Goodwill and Salvation Army. Demonstrate you are reliable, can follow and even contribute. You’ll meet real world people with real world problems that will teach you how to work with others than your peers. Great advice there Lorenzo. Thank you. It is really good that the companies are trying to increase the recruitment percentage, nevertheless I consider that it’s not enough. We need more opportunities for people without work experience. I would also like to say that it is unfortunate that degrees such as, “health sciences and education” are not being sought after by employers to hire as much as the “business/accounting” degrees. It would be in our best interest if we were to hire individuals that have undergraduate degrees in sciences. We need more science. That’s right our country wins when there are more people pursuing STEM fields.